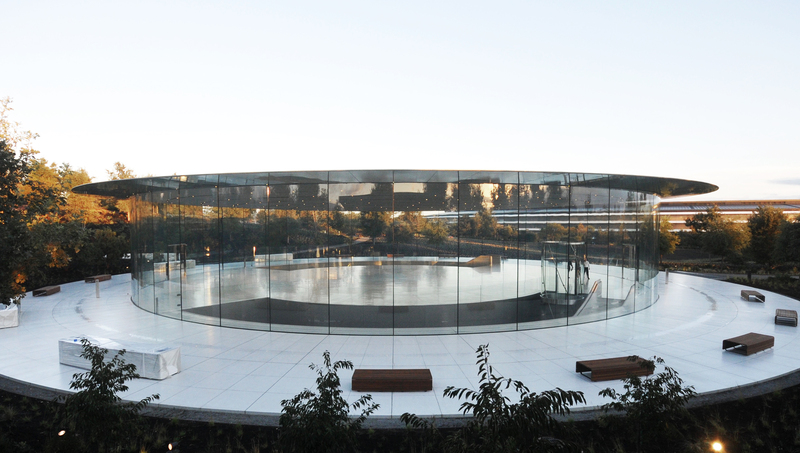 The Steve Jobs Theater Pavilion has received the Structural Award for Structural Artistry from the Institute of Structural Engineers (IStructE) at a ceremony in London. Regarding the pavilion's success, the awards' judges commented, "The pavilion exemplified structural artistry by creating the impression of pure simplicity, which is only possible through outstanding structural design. For example, to achieve the vertical support through the glass alone and to ensure vertical servicing runs did not compromise this achievement - by placing these within the glass panel joints - demonstrated the comprehensive application of excellence. "The beauty of form and detail of the pavilion celebrate the exceptional application of structural expertise across materials, analysis, design, detailing and construction, without any compromise, despite this being a relatively large project for the category. For a 47m diameter 80t roof to appear so light is fantastic. This achievement is both matched by, and in part due to, the lack of traditional vertical structure. The pavilion achieves the criterion of 'something exceptional'."